To identify and discuss research problems in the area of the chemical sciences whose development is strongly dependent on mathematical techniques. 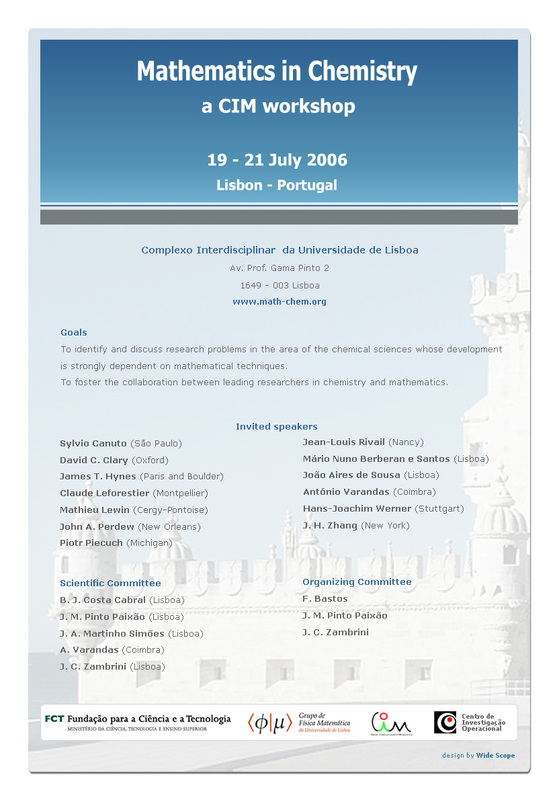 To foster the collaboration between leading researchers in chemistry and mathematics. Researchers and post-graduate students on mathematics or chemical sciences. Chemistry is an exact science since it relies on quantitative models that can be described and applied by using the mathematical language. For instance, the theory of chemical bonding and molecular structure, rates and equilibria of chemical reactions, molecular thermodynamics, relationships involving energy, structure and reactivity, modeling of solvation, are swarming with problems whose solutions require sophisticated mathematical techniques. Mathematics also plays a central role in many areas of "applied" chemistry and chemical engineering. Important examples include atmospheric chemistry, biochemistry, and the broad field of computer simulations. The development of faster and more accurate spectroscopic techniques, the design of molecular devices, biomolecular computers, and of new empirical methods to predict reliable chemical data, and the conception of more efficient chemical reactors are just a few of a vast number of other topics that have strong links to applied mathematics. A closer interaction between chemists and mathematicians may therefore lead to significant progress in many key problems in chemistry. The proposed workshop will foster that interaction since it will identify a number of important research issues which will benefit from a joint effort.